Henry Stoneson built this house in Lakeside for his own use. The past week witnessed the sale of the last completed home in Lakeside, located on Broadmoor drive, and immediate preparations by Stoneson Brothers to put down foundations for 15 additional homes to meet the increasing demand for higher-priced homes in the fashionable development. 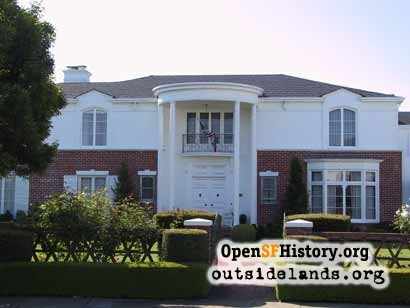 Among Lakeside's newer homes is the residence of Mr. and Mrs. Henry Stoneson on Stonecrest drive, overlooking Lake Merced, the golf course and the surrounding hills. The Stoneson home of 12 rooms, representing an investment of some $60,000 is located on an exceptionally large corner lot with a deep setback and wide lawns and gardens completely encircling the house. These include a huge front lawn, side lawn and fountain, rear rock garden and fish pool, a rear upper terrace and lower terrace with badminton courts, kitchen yard and broad garage runway and turn-around. The home itself is described by the architect, Harold G. Stoner, as a modern version of California colonial. The front entrance with its tall colonial pillars, opens into a huge entrance hall which has as its feature a winding staircase to the upper floor. To the left off this entrance hall is a large living room with deep windows and a lounge or den furnished in definite masculine taste. The lounge has its own fireplace and huge bay windows overlooking the side and rear gardens as well as the surrounding hills. The living room fireplace features a mirror background running from ceiling to floor. To the right of the staircase from the entrance hall are a breakfast room overlooking the rear garden and terraces, the kitchen and separate laundry room modernly equipped, and a large dining room. A powder room is just to the right of the entrance hall doorway. The dining room is papered on two walls with hand painted paper, figured with a continuous non-repeating bird and flower scene and the remaining two walls are in soft tints of bluish gray. The furnishings are of modern regency with white upholstered chairs. Modern regency furnishings are also carried out in the living room with a color scheme of soft grays and blues in carpet and walls, while the drapes blend daffodil yellows and eggshell into this background. The upper floor is given over to three bedrooms and two complete baths, including a very large master bedroom with a three way exposure, overlooking three gardens as well as Lake Merced. One of the features of this room is an octagonal dressing room, completely mirrored with tall panel mirrors, those in back of the dressing table opening to give access to a beautifully built in wardrobe lined with blended aromatic woods. From the front entrance hall a stairway leads down to a game room of nearly ballroom proportions, which has its own cocktail bar and lavatory. This room opens into the rear terrace and games court, providing an out-of-doors setting for entertaining. This floor also includes maids room and bath. Images: 1) 100 Stonecrest Drive, August 2002 (WNP photo). Sources: 1) San Francisco Chronicle, September 14, 1941.